Published in Rafu Shimpo, May 14, 1962. 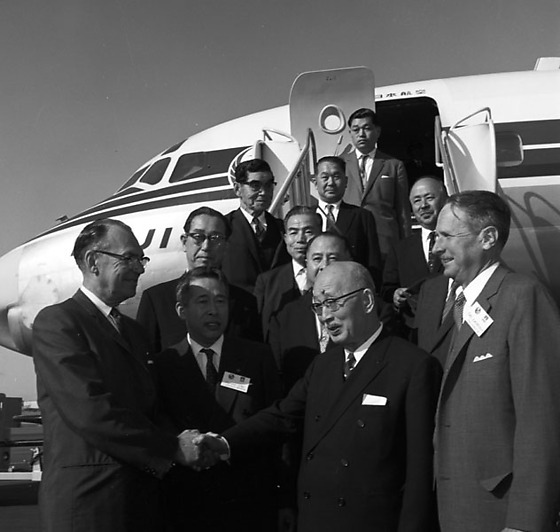 Mayors from Japan visit Southern California after a meeting in Washington, D.C., May 13, 1962. Includes Japanese mayors disembarking airplane and eating breakfast at the Beverly Hills Hotel. 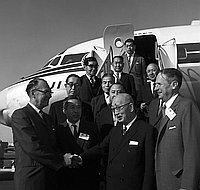 2N: Kanagawa Mayor Uchiyama, an older, bald, Japanese man, shaking hands with Los Angeles Council man Karl Rundberg, a balding Caucasian man in suit and eyeglasses, left, as another Caucasian man, the Consul General of Japan and seven other men in suits, including Saga Mayor Ikeda, Airchi Mayor Kuwahara, standing on airplane stairs look on. Typed on original negative envelope: Tokyo Mainichi -- Mr. Umejima.